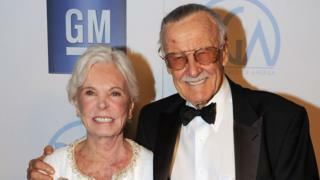 Tributes have been paid to British-born Joan Lee, wife of Spider-Man co-creator Stan Lee, who has died aged 95. The former hat model and her comic book maestro husband were set to celebrate their 70th wedding anniversary later this year. Marvel Entertainment said they had "lost a member of the Marvel family". American comic Kevin Smith, who interviewed Joan earlier this year, called her "Stan's personal superhero", adding: "Thank you Marvel Muse." In a statement published by The Hollywood Reporter, Stan Lee's family confirmed "the sad news that Joan Lee passed away quietly [on Thursday] and surrounded by her family." "Our thoughts and prayers go out to her husband and daughter," said Marvel in its own statement. "We are so saddened to hear about the loss of Joan Lee... Our thoughts and prayers go out to Stan and his daughter Joan in this difficult time." Stan Lee worked with artist Jack Kirby to create comic book characters like Thor, X-Men and the Fantastic Four. Joan Lee was the author of 1987 novel The Pleasure Palace and had several cameos in Marvel films, including last year's X-Men: Apocalypse. Writing on Instagram, Kevin Smith said that when he had met Joan Lee in January, she told him: "It's always Spider-Man, Spider-Man, Spider-Man. They don't know the amazing writer he really is." He added: "She then talked about the words her long-time love had written for her over a lifetime spent together. "There's a very famous story about Stan wanting to leave Marvel, in which Joan advises him 'Before you quit, write a comic you're proud of.' That comic was Fantastic Four - the birth of the Marvel Universe. "He told us tales of heroes but Joan was Stan's personal superhero - and without her, we never get our modern mythology. "They say behind every great man is a great woman. In this case, the great woman was always standing right beside him. Joan and Stan were best friends for 70 years." The couple had two daughters - Joan, born 1950, and Jan, who died three days after her birth in 1953.